For its annual sales and services event, Fico took advantage of early booking deals to gather staff in Berlin and motivate them for the year ahead. 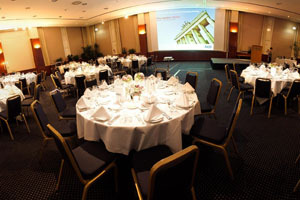 Pre-event planning: Analytics services company Fico employed Zibrant to help find a venue for its annual sales and services event, and the location chosen was the Crowne Plaza Berlin City Centre. The meeting had to be cost-effective because it was an internal event, so Fico corporate events director Joy Thomas started looking at cheap flights from the UK at an early stage, to take advantage of booking deals. She explains: "We often find that cheap European flights cost less than train journeys across the UK, so going abroad can be economical." The 2012 meeting involved a broad spectrum of attendees, including service groups such as HR and software-delivery teams. The event was held in Malaga the previous year, which proved to be successful, but Fico wanted a different destination for 2012. Thomas used data gathered from 2011 to shape the event's content, but most of the programme was driven by the company's yearly business objectives. Objectives: The purpose of the event was mainly to share information with staff and build team spirit. The event was also used to get employees motivated for the year ahead. "It was very much like a sales rally, but in this instance we included some service groups too," says Thomas. Challenges: While the event was straightforward to execute, according to Thomas, the main challenges involved keeping it within budget. "Getting travellers in and out for the event, and the usual last-minute changes on site, were also things we had to consider," she says. Solution: The event used the hotel's largest meeting space, Sektion I, II and III, for the general sessions. On the final day, delegates from the marketing and services departments were split, with sales teams divided by regions, using the hotel's smaller meeting rooms. Group dinners were held in the evenings in the main meeting space, which Thomas says the hotel managed to turn around quickly following the daytime meetings. A casual, networking-style event with a hotel buffet was held on the first night, followed by a more formal banquet-style gathering with a sales awards presentation on the second evening. Client verdict: Thomas says of the event: "The Crowne Plaza Berlin was perfect for the meeting and Zibrant did a very good job finding it. It was refurbished recently and was very good value for money in a great location." Post-event analysis: Staff were requested to provide feedback on the event so that the company could analyse how effective it had been. They were asked to fill in online forms using Etouches software. "We found the event had a very positive impact on morale for all attendees, which they took back to their offices afterwards," adds Thomas.